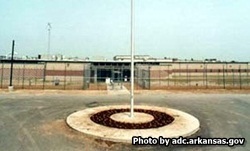 Grimes Unit is a medium/maximum security institution located in Jackson county Arkansas. The facility houses up to 1000 inmates and employs over 230 people. Grimes unit has a large population of technical parole violators, meaning inmates who have had to return to prison because they violated one or more of the terms of their original parole release. Grimes unit offers a wide array of treatments, programs and vocational studies. Inmates can receive substance abuse treatment, educational classes, as well as participate in an agricultural and gardening program. Grimes Unit also offers inmates vocational skills in its industry program and ICC garage. Visitation is on Saturdays and Sundays from 11:30am-3:30pm, but your inmates actual day/time will depend on their classification within the unit, so you should contact them to find out which day they are allowed. Visitors usually start arriving at 11am.